Discussion in 'Broadlands Community Issues' started by BigDog, Jul 7, 2018. What should be done with the Demott / Waxpool intersection? Over 800 views on this thread. How come so few people voted? This thread is being monitored by our supervisor Ron Meyer, so your opinion really does count. WillieC and JTC like this. In this case, not everyone will be impacted by the decision. I voted to close the pass through completely. The growth in our area will not slow down anytime soon. The final decision should consider traffic calming measures first. Any update on this? Hoping for a closure as well. Our supervisor, Ron Meyer, says he's monitoring this thread to evaluate feedback. Close the intersection. No U-turn at waxpool/ Claiborne pkwy. It's a residential area, not a "convenient" past-through or short-cut. I avoid that intersection and drive around because it is already UNSAFE to take chances, ESPECIALLY when I'm in a rush. Not worth anything to install a traffic light there - might as well put a traffic light at every intersection along that road (shellhorn/waxpool, faulkner/waxpool, ashburn rd/waxpool....). Also, for people using maps on smartphones (Waze, Google map), this route will be chosen automatically as it is a "faster" and "shortest" route to the north/south of it. So, either you close the intersection, or put a light on it, it will remain accident-prone, especially for drivers not familiar with the area. Not doing anything may not be a wise option. Id vote for a traffic circle, but that would require qualified drivers in this area, so short of closing it, I don't think there is any "safe" alternatives. I'm more concerned with the people who drive 30 -35 or faster down Demott and would rather see traffic humps and a few stop signs installed all the way down that road. I think that would discourage those trying to use it as a shortcut between Broadlands Blvd and Waxpool. And it would still leave a convenient outlet for the residents living closer to Waxpool. I like the idea of stop signs. At a minimum, have one at Vestals and one at the pool. And stop signs don't wreak havoc on snowplows. Folks around here run stop signs all the time. And do you think folks will use alternate routes? Anticipate the volume of cars to double...the focus should reduce the pass through traffic entirely. Ive suggested speed bumps on Demott before and some were more concerned on what it would do to their suspension vs the safety of the neighborhood. My assumption was that they do not live off Demott and have to deal with the speeding pass through traffic. Ideally, in my opinion, we would have speed bumps AND close off the intersection. Stop signs wouldn't do anything. At a minimum the intersection should be closed. Speed “humps” not “bumps” can be very effective and are far superior to stop signs. A few were recently installed in the Evergreen Mill Preserve community as a traffic slowing measure. As long as you go over them at 25 mph or less, they are not a problem. Keeps traffic moving and doesn’t force cars to constantly stop unnecessarily. Speed humps would be fine. Combined with closing the median, it would do wonders to limit speeding pass through traffic, especially by the children's pool and playground. would speed humps stop the people that would PASS moving vehicles on the left on demott? "In late June, traffic studies were conducted along Waxpool with specific data from the Demott intersection. This intersection was incorporation into a study of the Waxpool Road Corridor to Faulkner Way. County Staff has told us that it will take about twelve months for completion of the study so we should have results by Summer, 2019. At that time, the Board will be presented with recommendations for improvements and funding options. We are hoping that some of the improvements can be completed quickly but we are waiting on the recommendations. Our office got a traffic signal warrant in 2017, but the Board decided to incorporate this intersection into the wider study on Waxpool Road. The community remains very evenly split on whether to close the median or to build a signal, and we hope the experts' recommendations will help sort this out." On weekday during the rush hours in the morning or evening, it is very dangerous to pass through the intersection from Dermott since the traffic is flowing on Waxpool in both directions. Also, some impatient drivers would stop in the median halfway in order to cut through, making the situation worse. I generally avoid having to taking a left onto Waxpool and take Broadlands Blvd/Faulkner instead which is safer because it has a traffic light on Dermott and Broadlands Blvd. So if these are the only three options, I vote for adding a traffic light in favor of doing nothing. I think closing the median will make things worse because people will be more impatient to make a U-turn and the traffic staying on Waxpool now have a clear lane to speed up (even more dangerous). The likely results will move the potential accidents to both ends of the median and may create more congestion near Claiborne/Waxpool. If there is an in-between option for me to vote for, I would suggest using a traffic circle. This is pretty popular in European cities where smaller roads intersect to accommodate frequent traffic in all directions. I have to disagree. People around here do not know how to drive around traffic circles. I regularly almost always have to swerve to avoid getting hit by people that try to keep going through the circle, even though they are in the right, turn only lane. I live off Demott and a lot of people walk down that road and use the path there on the corners. Adding a light MAY bring more traffic, but it's almost the same with the lineup of cars there in the morning and afternoons waiting to turn left. I still thinking closing it would be best. I see your point, PP-Power. I live off Dermott too. But at least it's safer to turn left with a left-turn signal, right? It's also safer for walkers and dogs to cross the corners with a light signal for pedestrians. I believe a traffic circle was looked into but was deemed 'not feasible' because there is not enough space to build it. 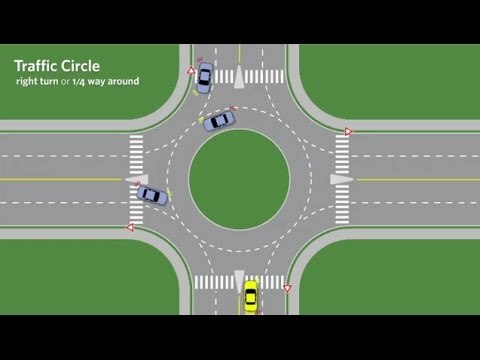 Traffic circles require more space than a regular intersection. My intersection at Stone Hollow and Claiborne Pkwy is getting worse by the day. Claiborne Pkwy isn't even connected yet to Brambleton so it will get worse. Stop lights are expensive and we can't put them at every street that intersects Waxpool and Claiborne Pkwy. What might be a better solution is to dramatically lower the speed limits on these roads that are tuning into highways. Cars are always traveling 10+ mph over the speed limits which puts them at the same rate of speed allowed on the Dulles Toll Road, 55 mph. Think about that.